"From whence shall we expect the approach of danger? Shall some trans-Atlantic military giant step the earth and crush us at a blow? Never. All the armies of Europe and Asia...could not by force take a drink from the Ohio River or make a track on the Blue Ridge in the trial of a thousand years. No, if destruction be our lot we must ourselves be its author and finisher. As a nation of free men we will live forever or die by suicide." At the same time as the sheriff's ignored press conference, the national media did cover assurances from the Obama Administration that crime was down at the border; that the border had never been safer. This ludicrous propaganda was based on selected crime stats from San Diego, Phoenix, Austin and San Antonio. The new reign of terror on the border in Arizona was airbrushed out of the picture. Here's the real picture Obama does not want you to see. 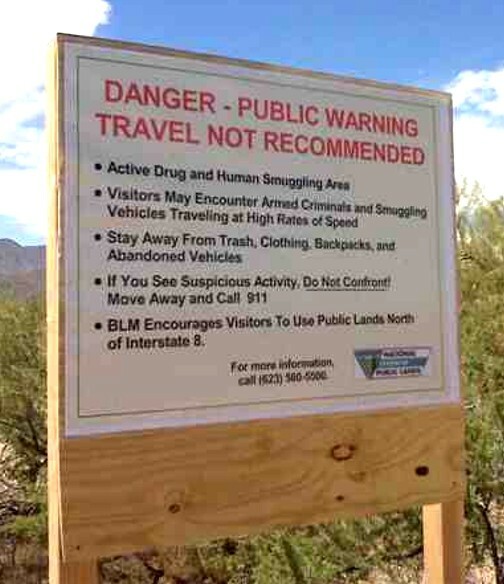 Warning signs were posted this past month by the federal government 80 miles North of the border on the South side of I-8 between Casa Grande and Gila Bend urging U.S. citizens not to camp or hike in the "Active Drug and Human Smuggling Area" because "Visitors May Encounter Armed Criminals." Read the rest of the story at Crossing a Dangerous Threshold by Michael Panzner. It is not a question of financial stimulus or fiscal austerity, which are a meaningless debate intended to distract attention from the much more serious problem. The fundamental issue is the enforcement of the laws, the administration of justice, the upholding of the Constitution and the Bill of Rights, and the reform of the financial markets and the economy. All things, all policies, are turned to foul ends while the system is driven by a fundamental corruption.